This was my sixth Carnival cruise and another great one! We decided to try something different this time - fly to a cruise port, in order to visit some new places - and so we did. 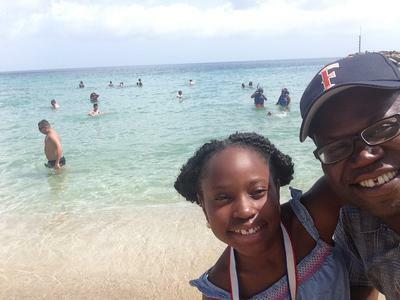 My family decided on this Carnival Liberty Southeastern Caribbean cruise, sailing out of San Juan to five ports of call: St. Thomas, Barbados, St. Lucia, St. Kitts and St. Maarten. We had visited St. Thomas and St. Maarten before, but all the other ports would be new to us. We chose to fly in the day before and stay at a hotel - well, an inn. Our flight got in after eleven the night before and our place of rest was the Borinquen Inn, less than a ten minute drive from the airport. Interestingly, taxi prices are displayed near the dispatcher's stand and we became excited when we say $12. Sadly, that is before certain surcharges are added: airport fee, gas, and one dollar per bag. Our total cost jumped from $12 to $20 rather quickly. Anyway, we got to our inn and found it to be quite comfortable. It is a small place, but very clean. Another plus is that it is located right across the street from several places where you can have breakfast. We did just that the next morning, before heading to the cruise port. We had to pay another $21 plus surcharges to get to the Port of San Juan, about fifteen minutes from the inn. After passing off our luggage to the porters ($1 per bag tip), we checked in quite smoothly. It was still early - about 1 p.m. - considering that the ship did not depart until 10 p.m. Interestingly, our cabin was ready and so we could relieve ourselves of the hand luggage. By the way, before getting to the cabin I must add something about the lobby/atrium area. As with all Carnival ships, the atrium was well-laid out and beautifully decorated. However, having been on the Crown Princess I realized how much better Princess' atrium areas are. Nevertheless, Carnival Liberty's lobby/atrium area is just fine and you will appreciate the space and design. For the first time ever, we chose a balcony cabin. Yippee! We wanted to experience having a porch/verandah area on which to hang out. It made a big difference. As opposed to being cooped up in the cabin, we were able to step outside early in the morning or late in the evening without going through the "front door." One of the many things I anticipated on this cruise was to experience Fun Ship 2.0 - Carnival's campaign to add new and exciting amenities to its ships. Carnival Liberty was among the first ships, if not the first one, to experience this upgrade. Some of the new things include: Guy's Burger Joint (sponsored by Guy Fieri); new bars; a Mexican food joint; the Punchliner Comedy Club - sponsored by George Lopez; water works; and Hasbro the Game Show. While Carnival Liberty did not get all the items listed in the upgrade, it got a few. I do not drink alcohol, so the bars did not appeal to me. However, I enjoyed eating from Guy's Burger Joint (try the Ringer Burger!) and the Blue Iguana Cantina. As for the Punchliner Comedy Club, I dare say that it was not what I expected. We attended the family shows, and while one guy was really good, the three other comedians were mediocre. I cannot say how they performed at the adult-only shows. Aside from the above and some noticeable wear on furniture (Carnival Liberty is an older ship), our Southeastern Caribbean cruise getaway was very good. The ship has enough amenities and hangout spots for people to find something to do. If not, one can choose to simply relax and do nothing. There were three pools, several hot-tubs, Serenity (an adult-only area - pretty cool), a slide, a giant movie screen featuring newly released films, shops, cool lounges, and fairly good nightly entertainment in the main theater. 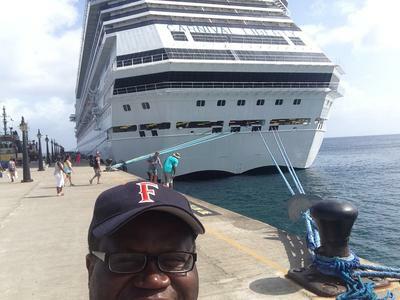 As I mentioned before, our Carnival Liberty cruise visited five (5) ports of call. Luckily for us, we had great weather in all except one - St. Lucia. It rained on and off all day. However, that did not stop us from getting on a ferry to downtown Castries, interacting with the locals and shopping in the farmers market. The weather cooperated in all the other ports, allowing us to do things which we wanted to. We visited the Coki Beach in St. Thomas - $18 per person roundtrip. In Barbados, we chose to tour the island. As usual, we did not book a tour on the ship but walked outside the cruise terminal. We found a tour operator, who gave us a great rate for the group - $14 per person. Some points of interest on the tour were a distillery, the oldest church on the island, a track and field complex being built to honor Usain Bolt, University of the West Indies and then a stop at the Copacabana Beach - beautiful place! 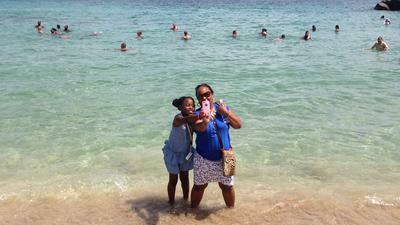 We also did a tour in St. Kitts and visited beaches in both St. Kitts - Friars Beach - and St. Maarten - Great Bay Beach. Our tour in St. Kitts was even less expensive than the one in Barbados (shh! - Only $10 per person!). For St. Maarten, we took a water taxi ($7 roundtrip) from the cruise terminal to downtown Philipsburg and the beach. I must say that I enjoyed all the beach stops on the cruise, but our favorite was Copacabana in Barbados. It was cleaner and more inviting. Friars Beach was super cool too! What a cruise! 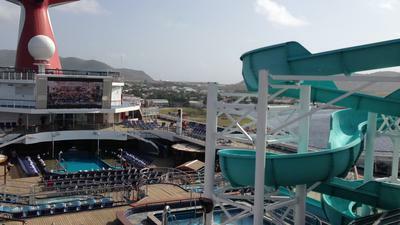 Your Carnival Liberty Southeastern Caribbean cruise getaway will be quite exciting. You will like the ship and enjoy the food. While the breakfast menu was the same each morning, we discovered that going to the main dining room helped to break the monotony and offered a warmer experience. Talking about warmer experience: There were super cool crew members onboard Carnival Liberty, who did their best to ensure we had a great time. Kudos, everyone! Taking a cruise, which offers more days on land than at sea, is recommended. I am glad that we did. We had just one day to do a little on the ship and to get some rest and then the others to enjoy all the beautiful ports of call. If you are considering sailing out of San Juan on a Carnival Liberty Caribbean cruise or another cruise line, just do it.